A LOVELY YOUNG GIRL: 7-8 months old / small Mostly Mutts adoption center is open Mon-Sat. 11-4pm. Some of us are in foster homes so please call 770-272-6888 1st to find out if I’m available to meet during the week. Hi, my name is Lady Grey! 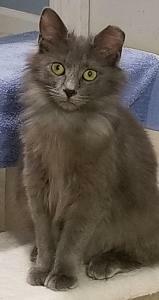 I am a beautiful, medium haired girl with absolutely beautiful eyes! I am a little slow to warm up to folks, but – just be patient with me, because when I do, I am super affectionate and enjoy being petted and given attention. I have a super load purr and will sing it to you to let you know I enjoy those belly rubs! In my foster home, I have some kitty friends, and I really like that! In fact, it may benefit me to have another kitty in my furever home. My foster mom says I am a ‘toy snatcher’ and will hide them (along with pens, paper, etc.) under the bed for safe keeping – lol. Come meet me and see if I am your new furry best friend! Gentle, older children only as I'm a kitty, and I am not a fan of dogs. I'm current on vaccinations, spayed, combo tested negative, micro-chipped and I will come with an engraved name tag. My Adoption fee is $175.00.